With Star Wars: The Force Awakens premiering this Friday, many fans of the legendary space opera are anxiously awaiting to see whether the new release lives up to the standards laid down by the original trilogy (released in the 70s and 80s of the last century) — movies that gained near-universal acclaim and deeply affected the film industry to this very day. The flip side of this is the concern that the new movie(s) suffer the same fate as the prequels (released in the early 2000s), which the Star Wars community mostly agrees were… not as good. Being the data freaks that we are, we decided to compare the original trilogy with the prequels to try and give an analytical answer to the question – what makes a great Star Wars movie? 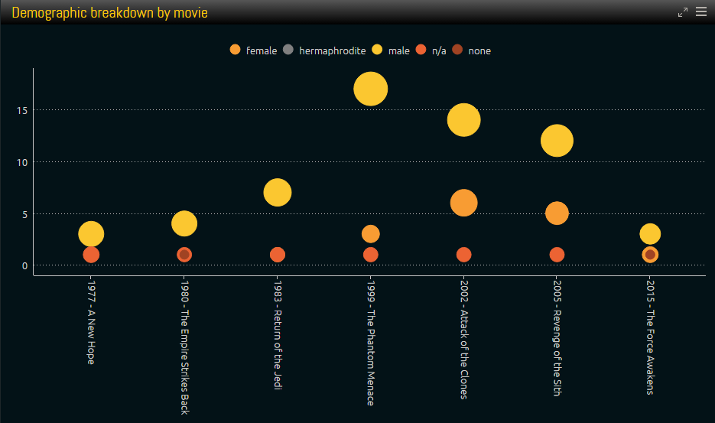 You can view the results in our Star Wars data visualization, or read on for some of the cool findings we made. Watching the prequels a while ago gave us a gut feeling that there were a lot more wacky aliens involved when compared to the original trilogy. Is this hunch supported by the data? We were surprised to see that the answer is a resounding yes. The above chart measures the ratio of humans to non-humans per film, and compares it with that film’s average Metacritic score. As you can see, there are dramatic differences between the original trilogy and the prequels, with the alien ratio drastically increasing in the newer movies, along with their Metacritic score dropping. Coincidental correlation or causation? We would guess that a little bit of each: two common criticisms of the prequels were poor writing, poor acting and unlikable characters. And while Chewbacca (from the original trilogy) is definitely a lovable critter, it’s reasonable to assume that writing convincing alien characters, which the audience actually cares about as more than a gimmick or comic relief, is more difficult. Hence more aliens = weaker plot = worse movies. The prequels are a bit longer than the original trilogy – but nevertheless the latter feature, on average, slightly more unique starships-per-movie than the former (10 vs 9.3), while the former had a much higher amount of characters who played a significant role in the plot (34 vs 18). This corresponds to another common criticism of the prequels: that they were boring and didn’t have enough action scenes. So it would seem that fans of Star Wars want to see more, um… wars in the stars, rather than the political and economic intricacies explored in the prequels. The smaller amount of significant characters also connects to our last point: it’s much easier to write a convincing script, and build empathy for, a smaller cadre of characters. Thus while Luke, Leia and Han Solo have become cultural icons, the newer characters did not seem to achieve the same cult status – and perhaps their abundance is partially to blame. 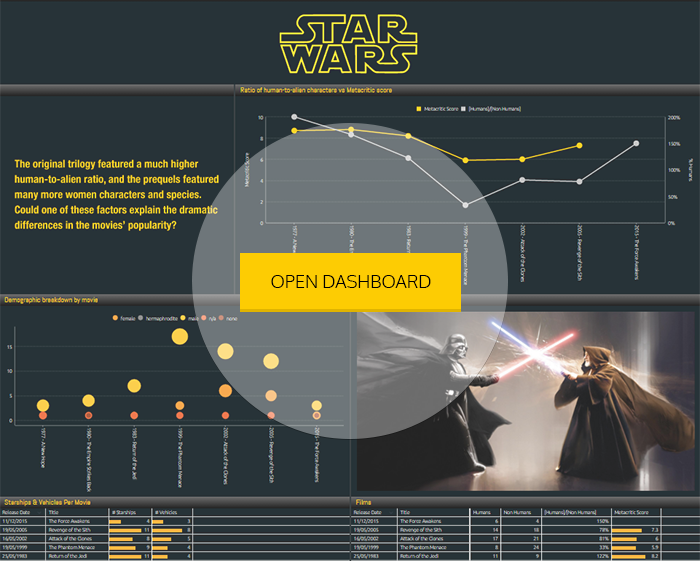 Explore the rest of our Star Wars dashboard. 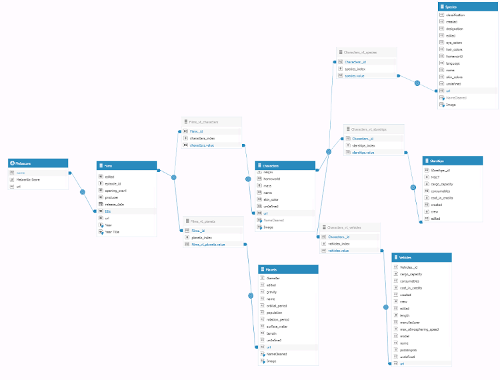 And from there creating the data visualization was a matter of minutes. Download a free trial of Sisense. Download and open the Star Wars Elasticube.